While in the marina laundromat yesterday morning, I met a woman I’d never seen before. She lives several hours’ drive away, but she’d accompanied her husband to our marina because he had a job here today. In less than one minute of introductory conversation, I discovered that her knowledge about sailing skills far surpasses mine. A half hour later, I returned to the laundromat to throw our clothes into the dryer. Guess who was standing in the parking lot beside her van? She immediately accepted my invitation for tea. Whenever I visit with strangers, I listen for “spiritual clues”—words or phrases they speak that tell me God’s pursuing them and that their hearts are being prepped to hear the Gospel. Knowing they’re already interested in spiritual things totally removes the fear factor about engaging in a conversation about Jesus with them. Sometimes those clues provide wide open doors to talk about Jesus. Other times, they come with a whisper that says, “Wait.” That’s what I sensed this morning. Meeting this gal was no mere coincidence. 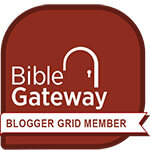 God alone knows her heart, but He’s given me a glimpse that shows He’s at work there. Now it’s up to me to pursue future contact. Apparently they come here once each month, so I’ll set up a lunch or dinner date during their next visit. I believe it was Henry Blackaby who said God works at all times and in all places. He’s right! We only have to be alert to His Spirit’s activity in our lives and wear our listening ears to discover that’s true. 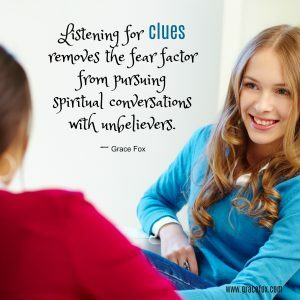 What are your thoughts about listening for spiritual clues in conversation with those who don’t yet know Jesus? Is this a new concept or something you already practice? If the latter, what clues have you received in recent conversations? How Can We Shine As Lights in a Dark World? If it feels right, I tend to give a spiritual clue as “bait” if I haven’t felt or heard a clue from the other person. I will “put out a feeler”, or scratch the surface of my faith to test the water. Their response let’s me know whether to move forward verbally and engage in conversation or prayerfully asking-do I go there or not, or pray that someone who will draw a better spiritual response or give a better response than me, shows up in there life. Hi Sherrie. Thanks for leaving your comment here. I agree with “if it feels right.” Listening to the Holy Spirit’s voice is important because not every person is ready to hear the news we want to share. Sometimes it’s right to open a spiritual conversation but other times we need to wait. And pray.